I received an e-mail yesterday from Jurlique (I went for their facial & massage before at Curve). The moment I read the e-mail subject, my blood sugar level rise! It's a workshop! *screams*. 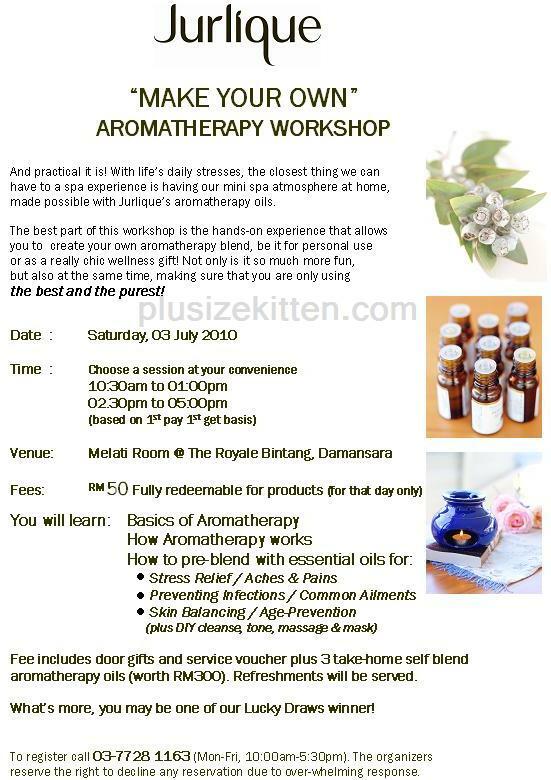 Not just any workshop, it's a workshop on Aromatherapy (which is something I am very interested in but have no idea what to do or start). The second thing is we hardly see Jurlique organizing workshops so I called up right away and register myself for a spot at 2.30pm. It's RM50 for a workshop, fully redeemable and you get a goodie bag worth rm300 as well. Payment is done via their Maybank or Public Bank account (they will give you the banking info when you register via phone) or you may drop by their branch in Curve to make payment. Please note that you will only be confirmed after making the RM50 payment. hehe. no money no seat. no rooms for jurlique sniff sniff..
rm50 what can i buy? hahaha but Rm300 worth of doorgifts yummmmmy! anyway Tammy do make a report bout it~ ho ho ho! the rm50 only can redeem for Jurlique treatments/services? how much usually the Jurlique treatments/services? Tammy... I called but the afternoon session is fully booked already. How? Can help ar? Hei, can ask Jurlique if they will hold such workshops in Australia? Sigh.... Jurlique here also don't have much to see apart from their sale at David Jones. would be fun if we go same workshop! i think never meet u b4 yet..